Naughton Energy Corporation was founded in Pennsylvania in 1976 as supplier of coal. The company gradually expanded its energy services and in 1985 incorporated. Taking time to profile the firm, is COO, J. Rory Naughton who reveals more about the company and highlights what it means to have been selected as part of BUILD’s DBE American Top 50. Established in Pennsylvania in 1976, Naughton Energy Corporation as a supplier of coal. Gradually, the company expanded its energy services and incorporated it in 1985. Naughton Energy is currently a supplier of distillate and residual, fuels, coal, lubricants and fuel tanks. The company’s primary market area ranges from Maine to Virginia with offices in Pocono Pines, Pennsylvania and New York City. Recently, our market focus was expanded with the opening of an office in Naples, Florida. 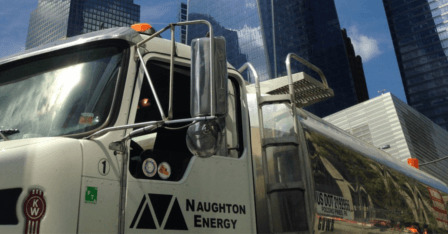 Naughton Energy maintains a fleet of fuel trucks in the New York City metropolitan area.  Coal – Anthracite & Bituminous. When managing staff, our company principle is to know the difference between skill and will. There are two main reasons for underperformance: a skill gap or a will gap. A skill gap is easy to close through coaching, training, and support that Naughton Energy provides to our staff. A will gap is more difficult to close. You need to take time to dig into your employee’s motivation. Do they understand how their work fits into the big picture? Also, we offer incentives and raises based on job performance and accuracy. When undertaking a new client or project, Naughton Energy uses a multi-faceted approach with a mix of planning, monitoring and controlling ownership of the product. When working with fuelling the construction companies’ sites, we take ownership over our fuel and assure that transportation and deliveries are on time and with safe high quality results. Our unique value sets us apart from other companies in this industry. Naughton Energy Corporation has a sound credit rating that allows the purchasing of products from a variety of refiners, and provides the ability to securely finance its contract obligations. A transportation network composed of truck, rail, barge and pipeline movements provide Naughton Energy with access to all regions of the country. We maintain a fleet of tank wagon fuel delivery trucks to deliver our fuel in a safe and timely manner. Overall, we are the best option for our clients because of our successful track record and customer service. There are many ways to look at energy and the oil and gas industry. Oil and gas provide the primary fuel for the daily energy requirements. The sources of energy come from coal, nuclear and hydroelectric power, renewables like wind, solar and tidal power, and biomass products such as firewood. When focusing on fuel energy people think of how it keeps us warm in cold weather and cool in hot weather, how we use it to cook our food and heat our water, how we generate our electricity and power our appliances and how it is used in building and construction. As a DBE small company supplier, we have faced our past challenges through divergent cultural and economic cycles. Throughout the years, we have successfully remained innovative and resilient in our business approach. We take pride in our work and as a safety oriented small DBE supplier and have created jobs by working well with our partners on multi-million-dollar bridge, airport and road construction projects, as well as, special event projects such as the United States Tennis Association US OPEN. We deliver our products on budget and on time enhancing our company’s reputation. Naughton Energy Corporation is proud to have earned the honor to be a part of the DBE American Top 50. Our company President, Mariette Naughton, is originally from the Philippines. Throughout the decades, both her and her team have made good decisions and have been able to stay focused and disciplined over the years to achieve economic success. For our small firm, as a Woman Owned Minority and Disadvantaged company (WMDBE company), being a part of the DBE Top 50 allows us to work in a diverse and inclusive environment where economic success is achieved for small business owners. We are happy to be a model for new WMDBE companies. NEC strives to keep up with the new projects and innovative energy plans and happenings. We participate in annual conferences nationwide as well as state, regional and local conventions and forum meetings to network and share our business experiences and successes and meet new potential clients. Most of all, we look forward to expanding our new products and services along the Eastern Seaboard as we grow as a DBE Top 50 company. We look forward to adding more products to our supply list and to supply more of what the need is in the construction industry. Here at Naughton Energy Corporation, we anticipate there will be more growth and opportunities with government infrastructure projects as we work closely with the Department of Transportation and Port Authorities. As for our future aspirations for Naughton Energy Corporation, we hope to expand our products and services and to be able to participate in more bridge and airport expansions along the East Coast. Alongside this, we hope to expand our products and services in the Northeast Tri-State area, as well as in the State of Florida. Naughton Energy Corporation is excited to look into new growth platforms in the industry – whether it comes to seeking new certificates, new regions and new clients, the changing economy of need and supply forces us to come up with a big insight, since sometimes a little one won’t do.